JGGL was founded in 1995 by Masashi Furuya who had extensive experience in both gem testing and trading. He and his family lived in Idar-Oberstein, Germany in the 1960s where he was immersed in new findings of gemstones, expert cutting and carving techniques, as well as the development of analytical methods in gem identification. His passion for gemstones led him to the sapphire rush in Ilakaka, Madagascar in 1999 as a geological advisor. 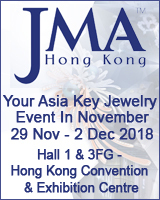 The philosophy of Furuya and JGGL has always been that gemstones are more than just a commodity; there is an emotional aspect attached to them because they carry the special attachment of miners, cutters, dealers and customers. With this philosophy, Furuya set up his laboratory to share his knowledge and passion for gemstones with consumers, dealers, miners and all people related to gemstones. From its establishment, JGGL focused on research and sharing knowledge related to gemstones, such as in contributions to The Japanese Journal of "Gem Information" and special editions for gemstones, such as on Paraiba tourmaline in "World of Gemstones" that were highly appreciated in Japan. At the same time, Furuya gave many lectures to gemstone dealers and end-users. He held a seminar at the Institute of Gemology and Jewelry Art Yamanashi Prefectural Government for gemstones and appeared on television in Japan to explain the theoretical formation of gemstones. These activities have been continued by his son, Masaki Furuya, after Masashi passed away in 2007. More than 15,000 gemstones and 2,000 minerals are in the collections of JGGL founder, Masashi Furuya, who spent over 40 years collecting them from all over the world. The specimens were collected directly from the gem mines where he had strong relationships with worldwide gem dealers. It goes without saying that the wide variety of localities of the sample stones helps with gem identification and origin determination. The older stones, without recent treatment, are quite helpful for the identification of new treatments using newly developed equipment such as EDXEF (elemental analyzer) and many kinds of spectrometers, including microscopic Raman spectroscopy. These important gem collections serve as the "brain" of JGGL. JGGL uses all necessary advanced analytical instruments. Specially, most of them are modified for testing gemstones with original attachments, and also for high throughput to test many samples quickly for routine gem testing. 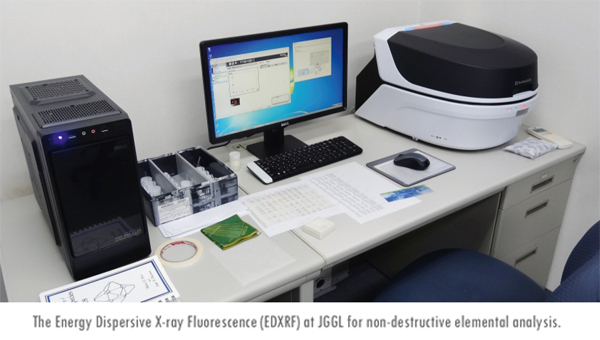 JGGL enjoys collaborations with manufacturers of analytical instruments, such as fluorescence and phosphorescence imaging for screening melee-sized synthetic diamonds and the Raman spectrometer for quick gem identification. Founder: Masashi Furuya, D.Gem.G., F.G.A., C.G.J. Japanese delegate of I.G.C., Assistant professor of Institute of Gemmology and Jewelry Art Yamanashi Prefectural Government. Spent more than 30 years in the gemstone industry in Idar-Oberstein and Kofu city and was the first to introduce agate cameo to Japanese market. Co-directed sapphire mining in Ilakaka, Madagascar from 1999 to 2002. Founded his gem laboratory with his enthusiasm for gemstones in the trend of decreasing natural beautiful gemstone and the increase of new treatments for gemstones. Passed away in October 2007. 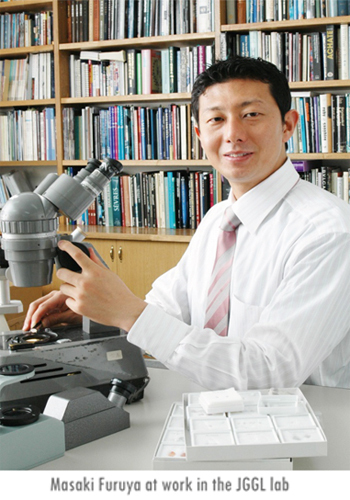 President: Masaki Furuya, M.B.A ., European Gemmologist., D.Gem.G., G.G., C.G.J. After studying gemology in Japan, U.S. and Germany, he earned a diploma of European Gemmologist of EU as the first Japanese person to do so. 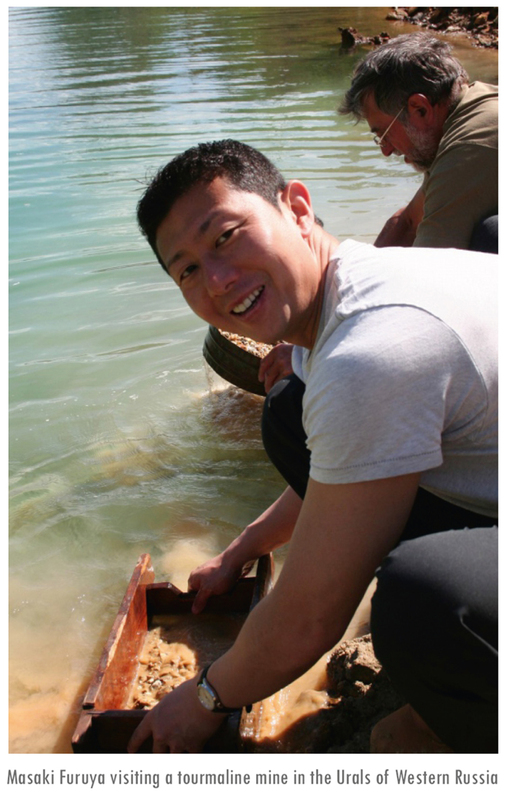 Co-worked with Masashi Furuya on sapphire mining in Madagascar, entered MBA program at Keio University, Japan.  Worked as a marketing consultant in Mitsubishi UFJ research and consulting Co., Ltd. Succeeded his father, Masashi Furuya, at JGGL in 2007.